What is the importance of mental rehearsal and how can sports kids use it to prepare for competition? Watch the video below, Sports Parents Success Video 6: Pregame Mental Rehearsal For Kids, to see what tips Dr. Cohn gives to sports parents to help their young athletes mentally prepare before games. 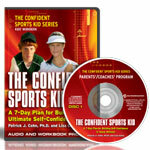 Self talk and improving negative thinking is huge for kids is this age group. Great video and i really enjoyed some of the others on your YouTube page. Keep it up Dr. Cohn, I will be following!